Windows Phone has been an outstanding mobile OS, obscured by a glossy black parade of lame, uninspiring hardware. So. Many. Generic. Black. Rectangles. The Titan, alongside Nokia's offerings, is perhaps the first Windows Phone handset worth running your eyes over (and over and over). People will notice your phone, and want to touch your phone, and care about your phone. You'll care about your phone, most importantly. 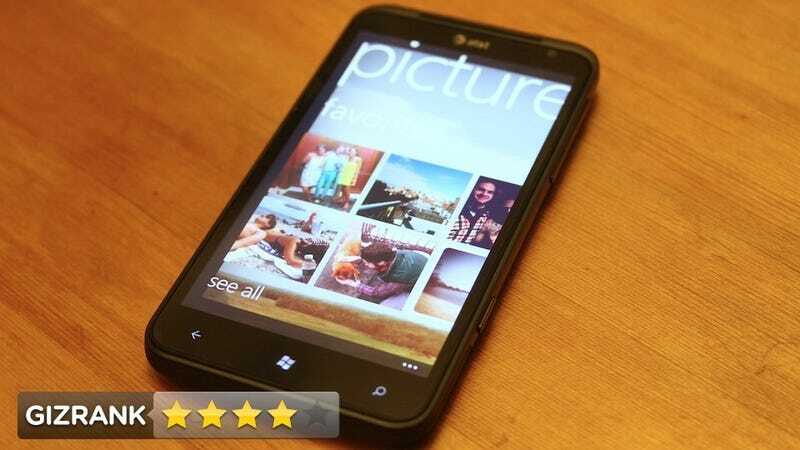 Windows Phone was born for the big screen—it looks absolutely gorgeous inside a giant frame. If you inflate Android to these measurements, it's a cluttered mess. You're just making room for more widgets. Ditto for iOS—all you're adding are more rows of apps. But WP is unlike anything else—it doesn't just expand, it luxuriates inside a big display. It's an inherently rectangular OS—an interface of vivid, superflat gliding tiles, not various clocks and bars and bubbles and weather balloons. It's regimented, spartan, and visually delicious. And when you take those tiles and transpose them onto a larger surface, there's only more to love—and this is the way it was meant to be. Windows Phone is an OS of hugeness—giant photos, grids of everyone you know, giant, fabulously legible text. All of these things look splendid on the Titan's crisp, vivid screen. Yes! It looks crisp, even with the pixels of that Windows-mandated resolution puffed up. So it's really not that surprising, then: a phone based on beautiful rectangles is great when it's an even bigger rectangle. It might look or sound unmanageable, but the Titan belies its name—it's skinny, light, and slips easily into your back pocket or bag. Consider it a small, friendly giant. That screen girth doesn't run on fairy dust—big display means big battery suckage, and the Titan can't defeat physics here. You'll find yourself charging the thing daily with regular use. The camera also leaves you wanting images worthy of the screen they're on—HTC should have crammed in their mightiest camera, and the difference is a real shame. More discerning eyes might be bothered by stretching out 800x480 worth of pixels across the Titan's display.